This Discount Monitor Stand For Sale with 42" Plasma TV Mount Includes Carrying Bags for Each Component for Ease of Transport. Order Today for Faster Shipping! 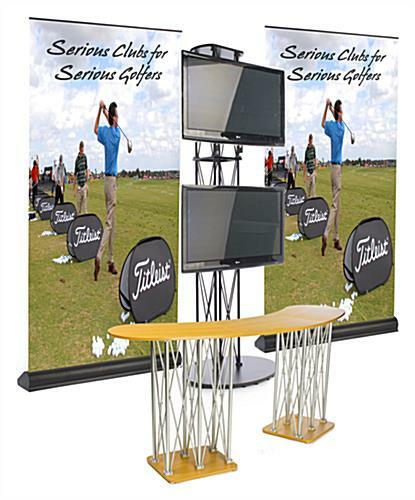 This monitor stand is a trade show booth that features a truss style display counter with 8' of counter space. This large counter is the ideal space to display merchandise, literature, or even give-a-ways. The monitor stand, trade show exhibit, includes a hard sided case that keeps all pieces of the display together during transport and can act as an additional counter when empty. This discount monitor stand for sale with 42" Plasma TV mounts also features two television stands that can support up to 50" LCD, LEC, or plasma television that weigh no more than 80 lbs. We provide a variety of carry cases with this monitor stand to make transporting the unit easy. This portable booth is an excellent way to leave a lasting impression on your customers! This monitor stand is great for creating an eye-catching exhibit that passersby are naturally attracted to. This monitor stand includes (2) tall banner stands with custom graphics. These banner stands have a 5' x 10' graphic that are easily seen from across the room. This monitor stand is portable and includes a carry case. The banner stand features a retractable 13 oz. vinyl banner, as well as a collapsible pole for easy set up and take down. This monitor stand is designed to support a wide range of televisions with screen sizes up to 50". These universal monitor stands support a large variety of television brands including Sony and Panasonic.